Ready to learn more about Alice in Wonderland concept art? You’ve worked on the eyes and seen how adding small areas of detail can add up to huge difference in your overall painting. 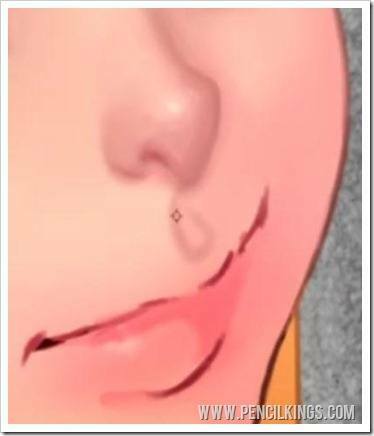 Now, we’re going to apply a similar technique to Alice’s nose and add some subtle, detailed areas of shade and highlight to really make this feature protrude from her face. 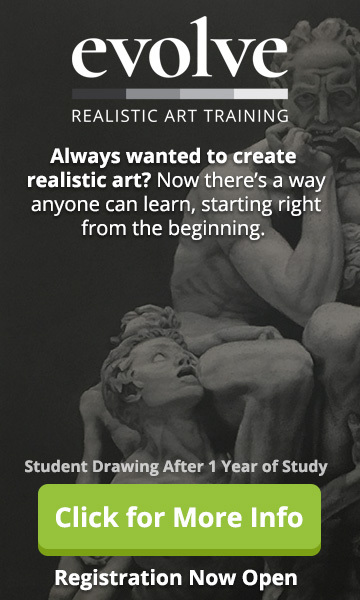 So, grab your drawing tablets and let’s get nosey! 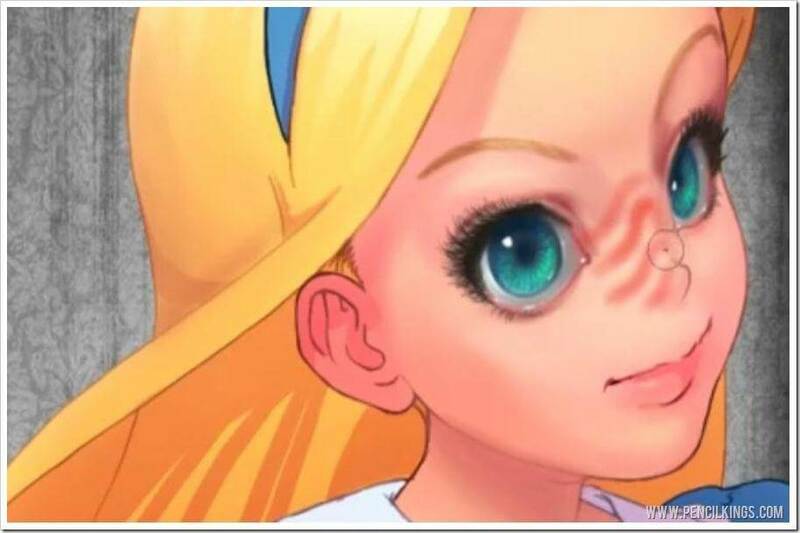 Now that you’re ready to begin work on Alice’s nose, you can start this lesson on Alice in Wonderland concept art by creating a new layer, then holding down the Alt key to make this into a Clipping Layer. 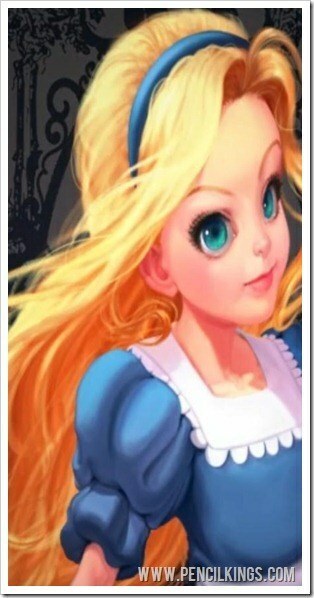 Alice needs some work on her nose, but we’re not talking cosmetic surgery here! Instead, we’re going for a much less drastic approach and adding subtle blends of shadow and highlight to give this feature real form. To start, select a fairly large brush and up the opacity to 70 percent. When you’re making these marks, try and think of the 3D structure of the object you’re painting. For example, notice how the lines follow the contour as the nose meets the face. In the words of James Brown, godfather of soul, let’s take it to the bridge! Or, in our case, the bridge of Alice’s nose. Having selected a large brush, add some sweeping areas of highlight to the bridge of the nose for this part of our Alice in Wonderland concept art tutorial. As the form comes around, you’ll need to start adding some shaded areas too, so pick up the color you’ve already used at the right-hand side of the nose and apply some subtle blends of this to define this feature. At the tip of the nose, pick up some of the pinkish color used earlier and use his to define the shape. Subtlety is key here and, although you may get tired of Sycra saying this, that’s just how it’s gotta be! 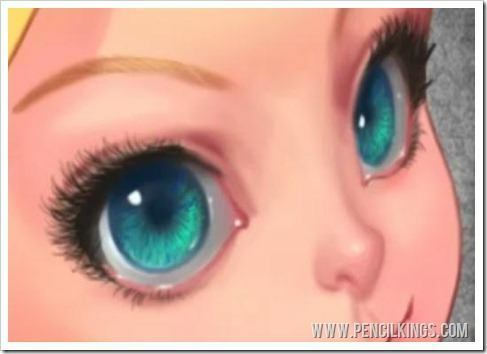 On the underside of the nose, pick up some of the shaded skin tone from Alice’s eyebrow and paint this in. You can also add a little subtle shading to the right-hand side of the area beneath. Now, it’s time to move on to painting the nostril – an essential part of any nose! If you’re unsure of how this should look, find a reference picture taken from the same angle and use this as your guide. 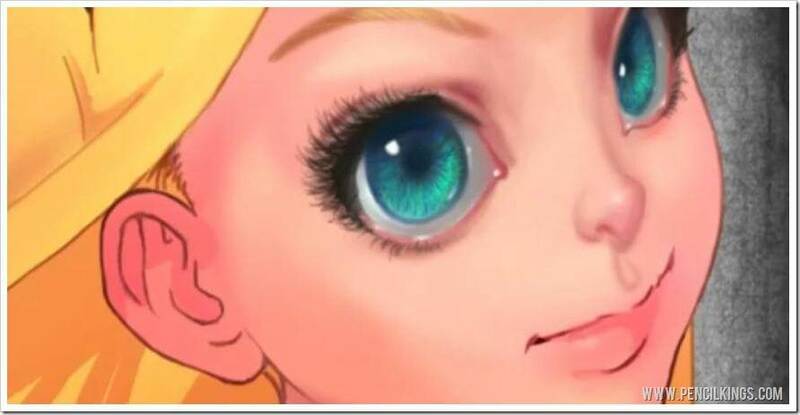 We want our character of Alice to have a cute little nose, so don’t make the nostril too big.At the top of the nose and at the tip, add some areas of highlight – you can always blend these out again if you feel they’re too strong. The highlight on the tip of Alice’s nose is quite bright, so you may want to lighten your color further to get this effect. Finally, define the nostril a little more by picking up some of the dark red color used on the outside of Alice’s eyes and using this to add the shaded part of the nostril. It’s a little known secret that nostrils always look better when using a dark red rather than black, so here’s another professional tip that you’ve picked up through watching our lessons here at Pencil Kings! Overall, we want the nose to be quite subtle without any hard lines. However, on the other side of the nose, we do need a hard edge to define it. So, to do this, take some of the cheek highlight color and select a smaller, harder-edged brush to give you a nice precise line. The small indentation you get here is known as the philtral dimple and you can add this easily using a brush with lower opacity.It’s a kind of ‘U’ shape, but don’t get too detailed here – we just need to give a sense of this feature. You can blend this out as you get closer to the top of the nose. Doing this is a perfect example of how you can use soft and hard edges in your work to achieve awesome effects. While we’re here, we’re also going to take some of the shadow color and define the philtrum – the area between the nose and mouth. 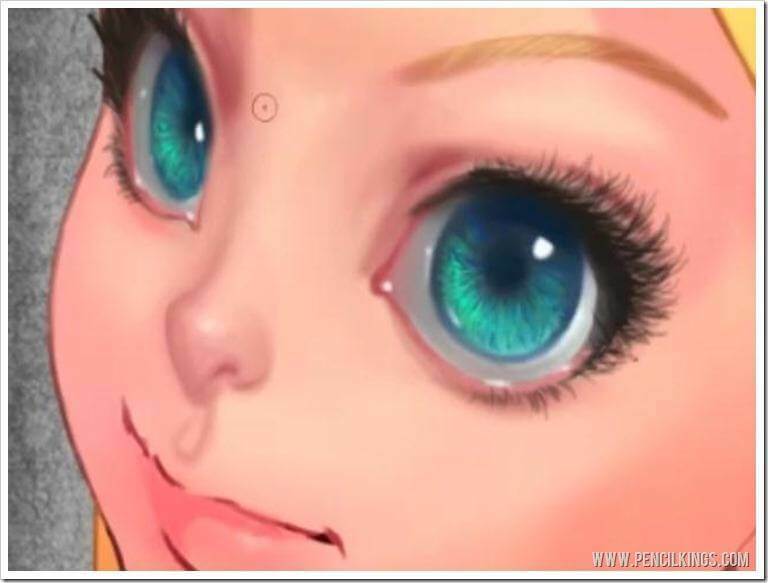 Now that you’ve worked on the various facial features in our Alice in Wonderland concept art tutorial, it’s a good idea to flip your canvas horizontally to see if there’s anything you want to change. 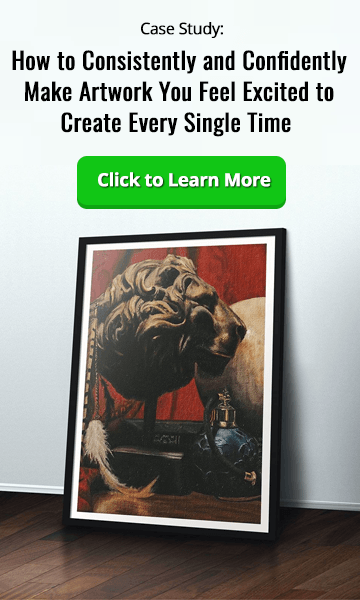 Like we’ve said before, it can sometimes be difficult to spot any mistakes when looking at your painting from the same way – sometimes, flipping things can give you a whole different angle on your work. Through flipping his canvas, Sycra notices some areas such as the top of the nose and the cheek where he wants to blend the colors a little more. After looking at his painting, Sycra decides to make Alice’s nose a little redder. However, he wants to do this without affecting all his hard work on previous layers. The solution here is to create another new layer and change the mode of this to Color. Then, taking a redder variation on the skin tone, he can quickly brush in some color to make Alice’s nose appear redder than some of the other areas on her face. Once he’s done, he feels the color is now actually a little too red, but he can change this easily by reducing the opacity of this layer to around 40 percent. If you decide to do this too, you’ll find the opacity slider at the top of the Layers palette. Once you’ve finished, turn these new layers on and off so you can compare how the changes look. 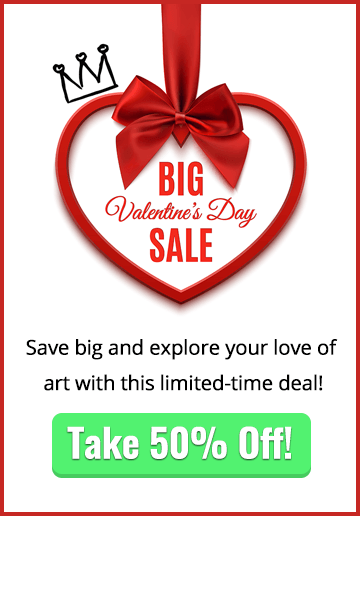 The final stage is to merge all these new layers down and then compare them to the original so you can see just how far you’ve come in your painting. We think you’ll agree that your painting is now looking pretty awesome! 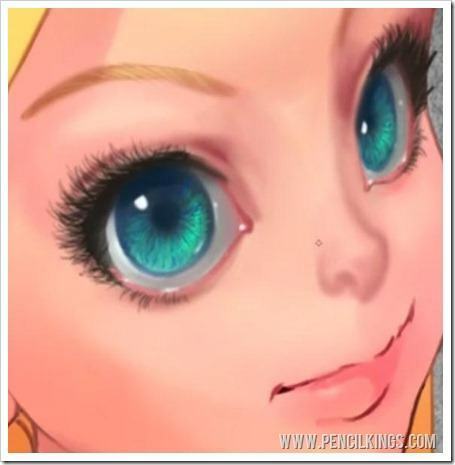 In the next lesson on Alice in Wonderland concept art, we’re going to be adding details to the ears and seeing how subtle blends and highlights can make this other important facial feature stand out.